As Ensemble- in-Residence, we teach private students and chamber music groups, and we organize and administer the student chamber music program. Running the program includes hearing students in audition every September, forming approximately 20 student ensembles, coaching chamber music groups, assigning groups to specific coaches, teaching master classes several times each quarter, and planning and presenting formal student chamber music concerts. The program has grown significantly since we joined the Stanford community, in size and quality, and it provides our hugely talented pool of Stanford student musicians the opportunity to study chamber music in a structured, positive, and energized environment. 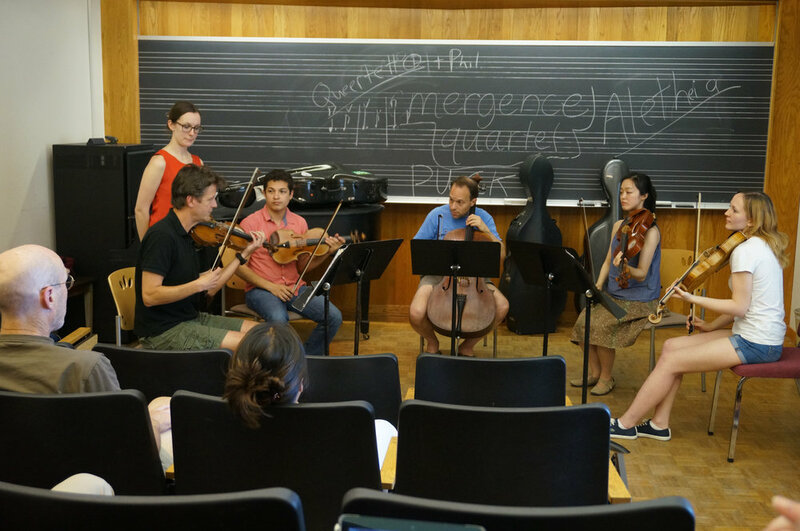 In addition to our work as coordinators and administrators of the Stanford string chamber music program, each of us in the quartet teaches a number of private students and coaches several chamber groups each quarter. We work one on one with each of our talented and focused students through weekly hour-long lessons. Many of these gifted students could easily have chosen a music conservatory approach to their education, but instead opted for the myriad possibilities available to them at Stanford. Our students choose a wide mix of majors, including music, human biology, law, medicine, English, math, physics, and engineering, yet still have a need for and find time for the intense study of instrumental music. Over the past eighteen years several of our students have graduated from Stanford and then gone on to pursue Masters degrees in music performance at such distinguished music schools as the Juilliard School, the New England Conservatory of Music, and the San Francisco Conservatory.